Directors across the South have been telling us that the spring trips with a cost of $1,000.00 and up have infringed on their teaching time, and have caused the neighbors of band and choral students to hide when they see them coming. The new Panama City Beach Music Festival offers a solid solution to that dilemma. 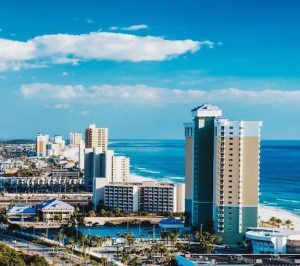 With new condos right on the beach, Pier Park, which is one of the South’s coolest shopping and dining complexes, and with unique attractions like Dave & Buster’s, Wonder Works, Rocket Lanes, Jimmy Buffet’s Margaritaville, The Spinnaker, and Shipwreck Island, this is pure fun. Oh yeah, and it all happens on one of the world’s most beautiful beaches. There’s more savings in transportation costs due to our close proximity to high schools and middle schools in Alabama, Florida, Georgia, Louisiana, Tennessee, and Texas. And when you get to Panama City Beach, every condo, motel, attraction, and restaurant is within a ten-mile radius. The best part of our festival is that we guarantee you the best service of any festival you have ever attended. Add up all of those amenities at a price under $300.00, and we believe you’ll agree that dollar for dollar this is the best band or choral festival trip in America. Now you can go back to teaching kids some music.